I can't begin to explain how much of a misfire Yogi Bear is. Perhaps if there was some sort of resurgence of the character in popular culture, this simultaneously bloated and anorexic big-screen adaptation would have been deemed welcome. The fact is, it's a movie targeted at kids, but using a franchise that only their parents might recall, and even then, it kind of stomps on that nostalgia with far too many jokes about excrement, flatulence and other similar bodily functions. The plot is pretty straightforward, and as expected from a world where the worst thing that happens is a couple of animated bears steal picnic baskets, rather benign. Still, the great public park of Jellystone is under threat of redevelopment by a corrupt mayor (Andrew Daly) and it's up to Ranger Smith (Tom Cavanagh) to balance his budget in order to save the day. Did we tell you the challenge was quite bland? Well, not with pesky bears Yogi (Dan Aykroyd) and Boo-Boo (Justin Timberlake) around, driving patrons away with their various antics, all in the name of snatching some food. In 3D. Add to the mix documentary filmmaker Rachel (Anna Faris) who comes to Jellystone to capture the notorious talking bears and predictably sparks a romance with Ranger Smith. All the basics are there for a marginally enjoyable kid's movie, right? Well, as anyone who's ever seen a Yogi cartoon will tell you, the character is "smarter than the average bear", but this film is not. It spends too much time chasing its tail in the hopes of landing in the middle of some great slapstick routine, but just makes you dizzy in the process. The dialogue is irritatingly unfunny, and the human characters manage to be more cartoonish than the animated title character. And this brings me to a more serious point, which is emblematic of a lot of entertainment geared towards the youngsters of today: Why are all these kids movies so damned stupid? Children deserve better than this. Pixar has the right idea, and demonstrates that children's entertainment doesn't have to stoop to elementary school bathroom humor to connect with the kids or bank on nostalgia to entertain the adults. Sure, it takes added effort and a lot of talent, but when you're spending millions, you should want the best product possible. The added irony is that Warner Bros. used to be a leader in cartoon programming. Where's that pedigree now? 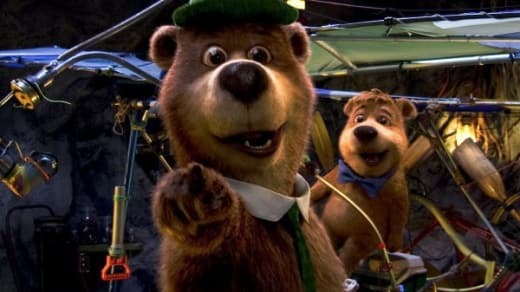 With Yogi Bear, Warner Bros. demonstrates that throwing money at a problem can't fix it. Even with 3D photography enhancing the antics perpetrated by Yogi and Boo-Boo, the film is barely entertaining, and proves once and again that you still need a good story, strong characters and decent dialogue to drive a film. While kids may be able to swallow the bitter pill that Yogi Bear has become, the adults will probably be wishing that the fake Assasination of Jesse James ending where Boo-Boo shoots Yogi in the head was real.